Our two wire surveillance kit is a TRUE two wire unit, meaning there are one wire that contains the clear tube ear piece and one wire that contains the NOISE REDUCING microphone. 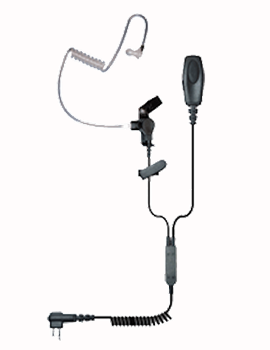 The two wire surveillance kit offers the most discrete and private use of the two way radio. The clear tube earpiece allows the user to blend in with the crowd without anyone knowing you are using a walkie-talkie. The noise REDUCING microphone allows your conversation to be heard loud and clear even in noisy environments such as concerts, large expo centers or outdoor events.